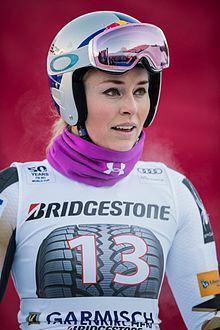 ↑ "Athlete information: VONN Lindsey". Fédération Internationale de Ski. Retrieved March 18, 2013. ↑ "Lindsey Vonn wins 3rd straight overall World Cup". ESPN. Associated Press. March 12, 2010. Retrieved May 30, 2011. ↑ "Lindsey Vonn wins Are GS; clinches fourth overall title". FIS Alpine Ski World Cup. Fédération Internationale de Ski. March 9, 2012. Retrieved March 9, 2012. ↑ "Vonn, Mancuso go 1–2 in downhill". Associated Press. February 17, 2010. ↑ "Tina Maze makes history again by winning the super-G in St. Anton". Fédération Internationale de Ski. January 13, 2013. Retrieved January 13, 2013. ↑ Svrluga, Barry (2018-02-21). "Bronze doesn't begin to tell the story of the greatest female ski racer of all time". Washington Post (in ਅੰਗਰੇਜ਼ੀ). ISSN 0190-8286. Archived from the original on 2018-02-21. Retrieved 2018-02-21. ↑ "Vonn, Lysacek take home USOC awards; more Olympic notes". CNN. January 25, 2011.